I’m all about easy these days. Come to think of it, it’s been that way for some time now – 4 1/2 years to be exact. Ever since we became a family of three, and then four, there is little time for three course dinners requiring multiple pots and pans. A holiday dinner? Sure. A special Saturday night? Bring it on. But for the everyday weeknight meal? My motto is the less pans the better. I actually first discovered the joys of no-boil gnocchi when Erin and I tested one of our fave gnocchi recipes EVER and skipped the pre-boil stage. Well, after that, there was no going back. This Sheet Pan Gnocchi is more of a method really – you could switch up the vegetables, add different herbs or seasonings, throw in some sausage if that’s your sort of thing. 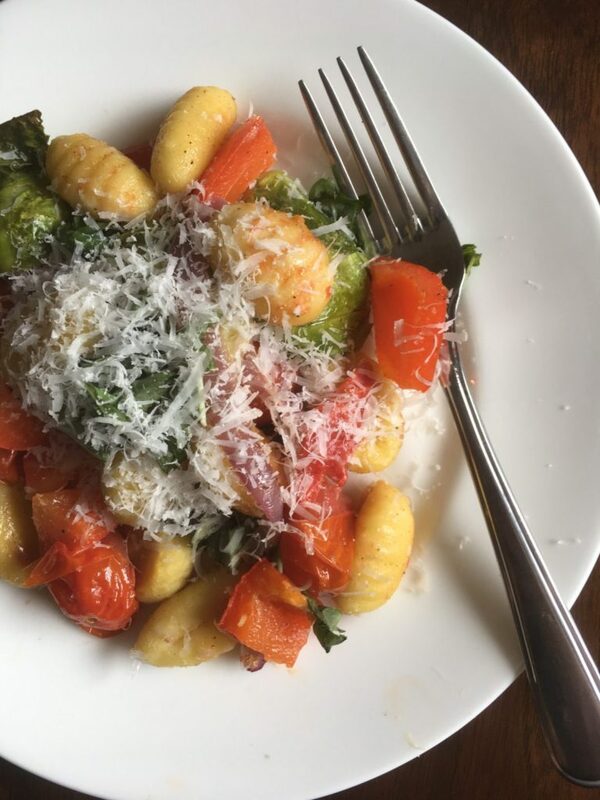 The gnocchi bake up into something that is chewy and crispy and absolutely irresistible. I’m a texture girl and these are texture heaven! 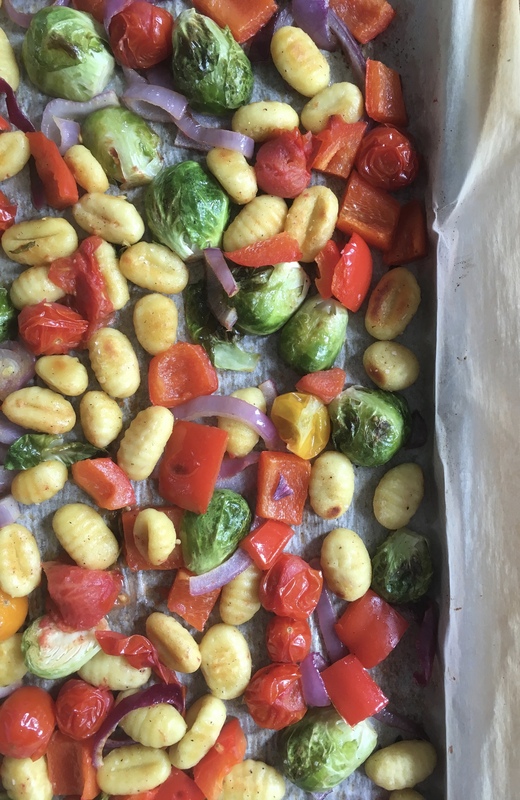 This Sheet Pan Gnocchi is also the perfect family-friendly meal. 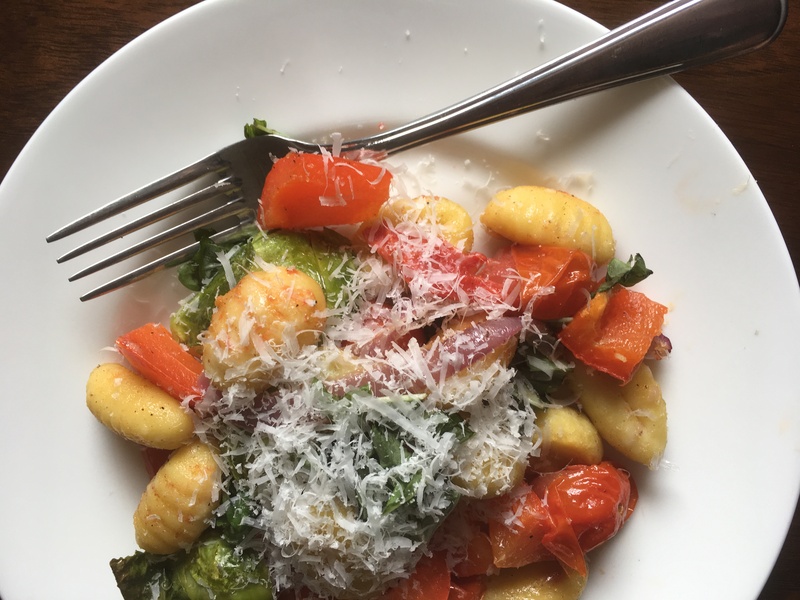 I left some gnocchi plain on the side, had a bowl of shredded cheese and some raw cut up peppers and tomatoes. The kiddos were able to choose what they wanted and the whole fam was eating the same thing, even if it looked a bit different. Deconstructed dinner for the win! 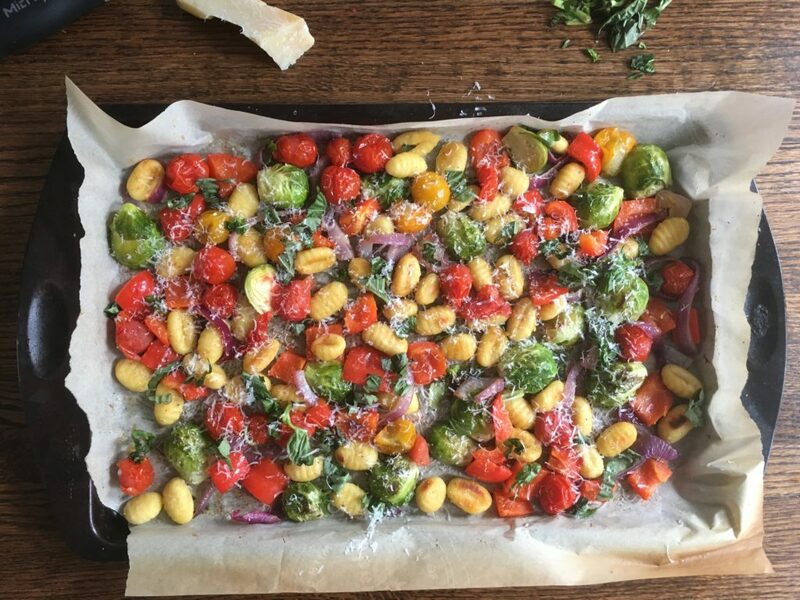 You can have this beautiful Sheet Pan Gnocchi on your table in about 20 minutes – Can’t really think of an easier dinner than this. You could use any vegetables you had on hand - mushrooms, zucchini, eggplant would all be delicious. 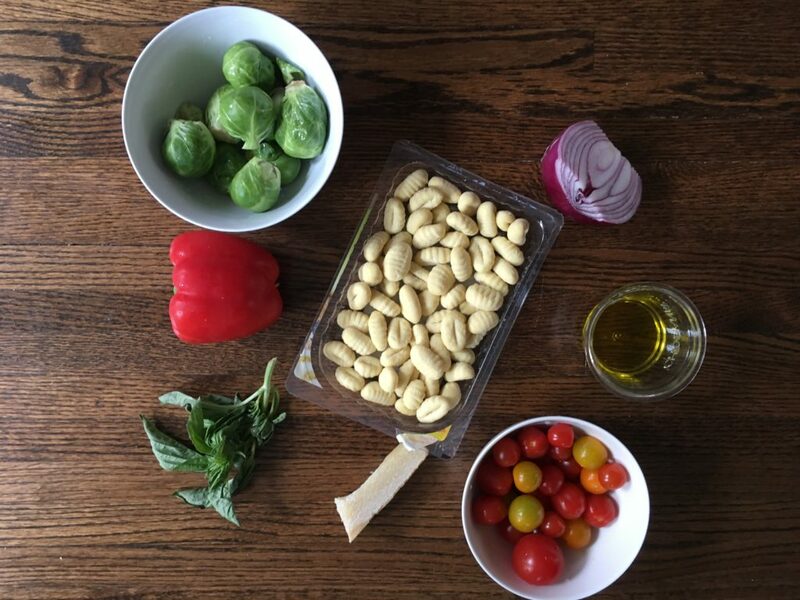 The gnocchi would also be delicious topped with some creamy goat cheese or fresh mozzarella. 1. Preheat oven to 450 degrees and line a large baking sheet with parchment paper. 2. 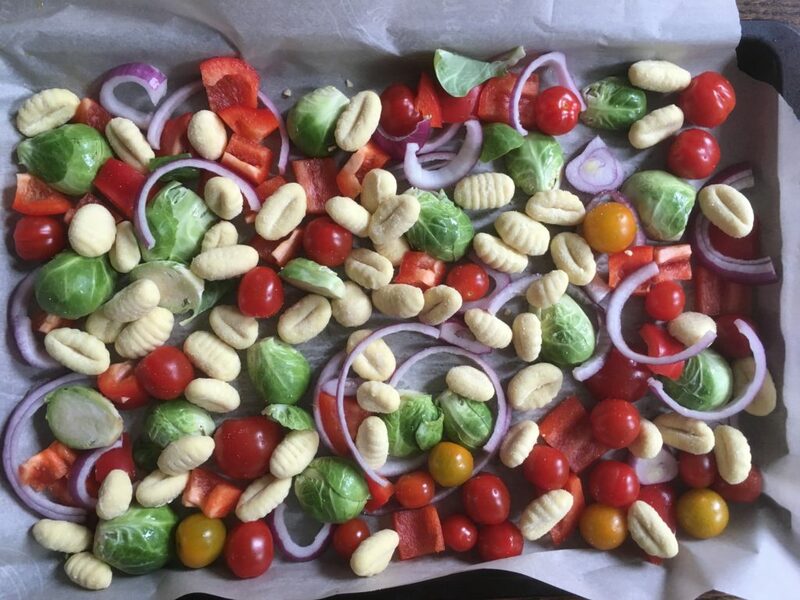 Add gnocchi, tomatoes, onion, brussels sprouts, pepper to prepared baking sheet. 3. Drizzle with olive oil and sprinkle with salt and pepper. Toss until all the ingredients are evenly coated. 4. 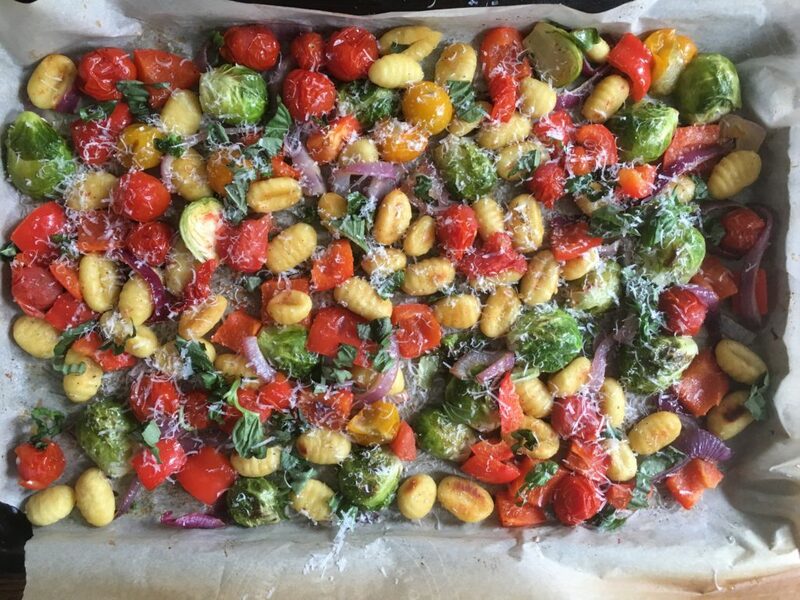 Bake in the oven for about 15 minutes, until gnocchi is lightly browned and vegetables are softened and starting to brown. Remove and top with parmesan and basil and serve immediately.